We had big plans for Halloween and then... we all got sick. Anyway, Mason stayed home from daycare with Seth (super dad!) on Monday, Tuesday, and Wednesday last week. Thursday Mason's cold had gotten a lot better though he still had a bit of a cough and a small runny nose (so hopefully pre-school had kleenex's on stand by). Of course by Thursday, I re-got whatever I had the week before along with the added sneezing and coughing. Why is the only part of fall that California is getting is cold season? And how do you get a cold when it's 80 degree out? 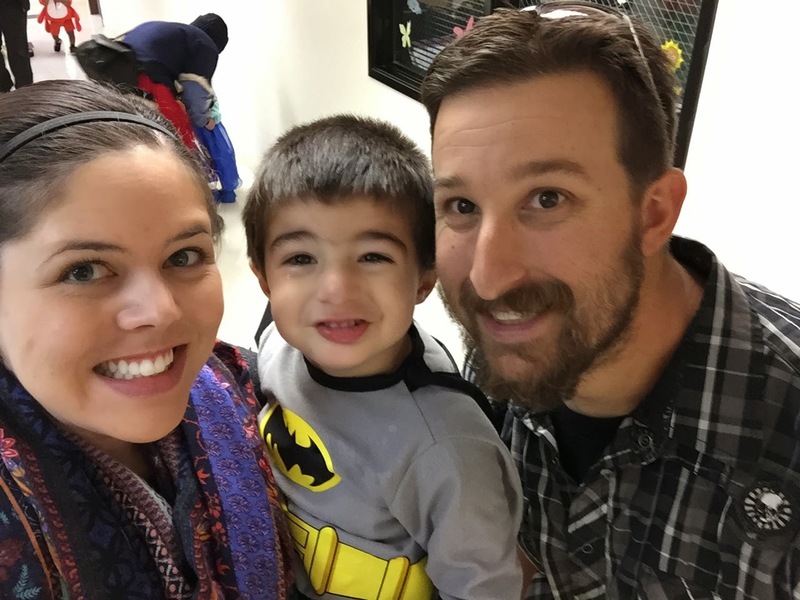 Anyway, Mason's pre-school was having a special Halloween potluck and trick or treating at school on Thursday so I was super glad that Mason was feeling better and could go. Luckily Seth had taken out Mason's old Halloween costume from last year (Batman) and tried it on while they were home on Wednesday. It fit (!!!!) which was prefect because that's what I intended on him bringing to pre-school for trick or treating and dress up. Wednesday night I attempted to try on Mason's real Halloween costume (Jake) and not only did Mason want none of it (cue running away screaming) but it also looked TEENY TINY. It had elastic but I'm pretty sure it wouldn't fit still. We tried to hold it up to Mason to see if it would fit and he just ran away. Maybe it was a sign that he wasn't supposed to be Jake after all. So off to Target I went on Thursday morning trying to find a costume that would fit my skinny and tall two year old. Not such an easy feat the day before Halloween. I actually ran into my mother-in-law who was shopping for some goodies for her work and together we were able to find something that we thought would work (Captain America). 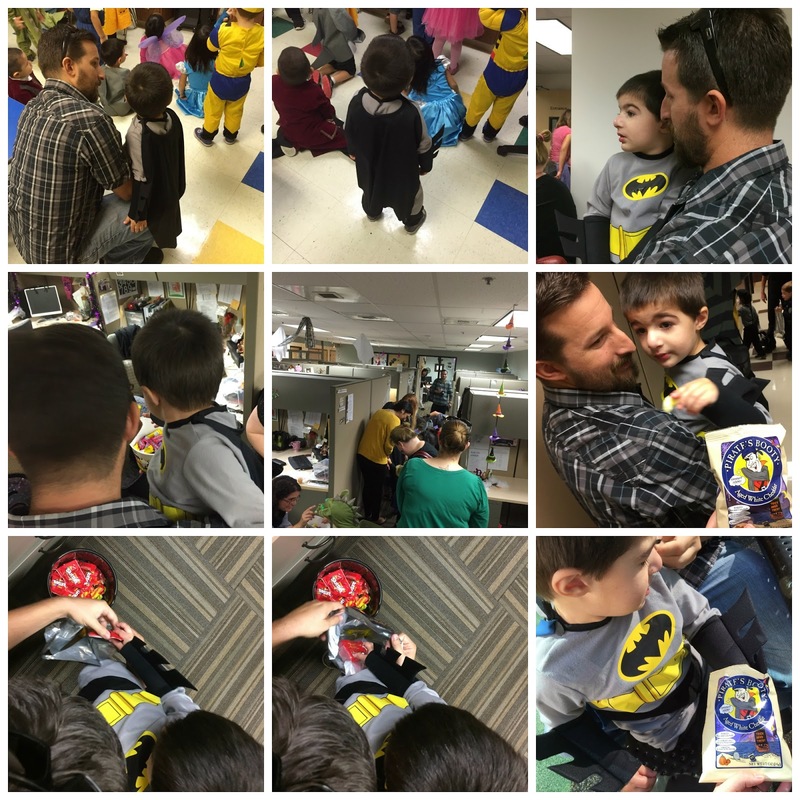 After Target, I headed to Mason's preschool for the little Halloween party that they were having. I was SO excited and had high hopes of what fun Seth and I would have there with Mason. And then he saw us... and had an epic meltdown. I think he thought that it was time to go home because the only time he ever sees us at preschool is when we drop him off or pick him up. He must have been having a good time because he was not happy to see us. Seth picked him up and calmed him down but after that, he didn't want to trick or treat. 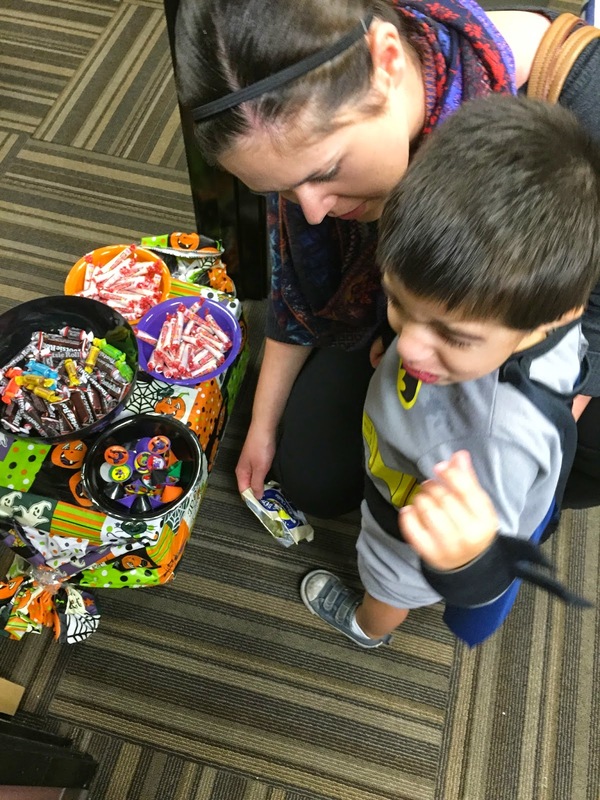 They had set up a cute little trick or treat path for the kids to follow and went cubicle to cubicle around the office area. We walked along with the other kids but Mason refused to pick up any candy. The only thing that made him happy was the lady handing out Pirate's Booty. After the trick or treating, they were hosting a potluck. We tried to stay but Mason was still upset and wouldn't let us put him down so we handed him over to his teacher and decided to leave. He did cry then also but we walked outside and peeked in the gate to the playground a couple minutes later and he was TOTALLY fine and playing on a bike. Needless to say, we probably won't be attending any more potlucks/functions for a while. Sorry Mason. Then came actual Halloween. We had plans to go trick or treating with Mason's cousins, like we do every year (see last year here), but Mason was just starting to recover from his cold and I now had it so we decided to stay local so we could all get to bed early. So instead we went to the trunk or treat that Seth's mom's church was hosting at a nearby school. We arrived and it was a lot bigger than I thought it would be! 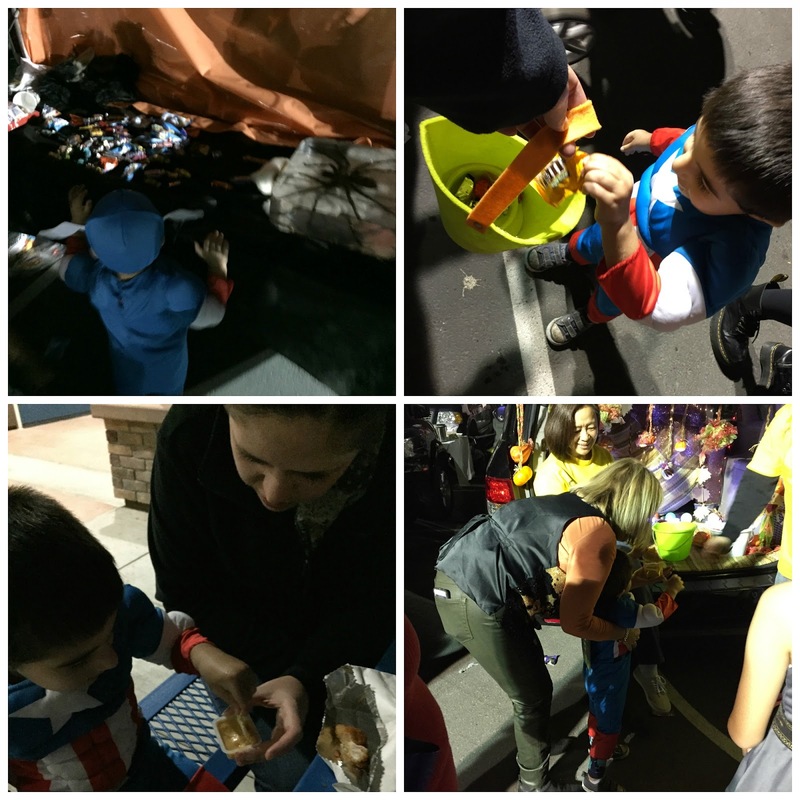 They had food trucks, bounce houses, Chick Fil-A, a train, face painting, pony rides, cupcake decorating, and of course trunk or treating. We walked around a bit before we got some dinner and then met up with Seth's mom. We only hit up a few trunks as Mason refused to walk and only wanted Seth to carry him. If Seth walked up to the trunk, Mason would reach for the candy and then put it in his bag though. Laziness at it's finest. 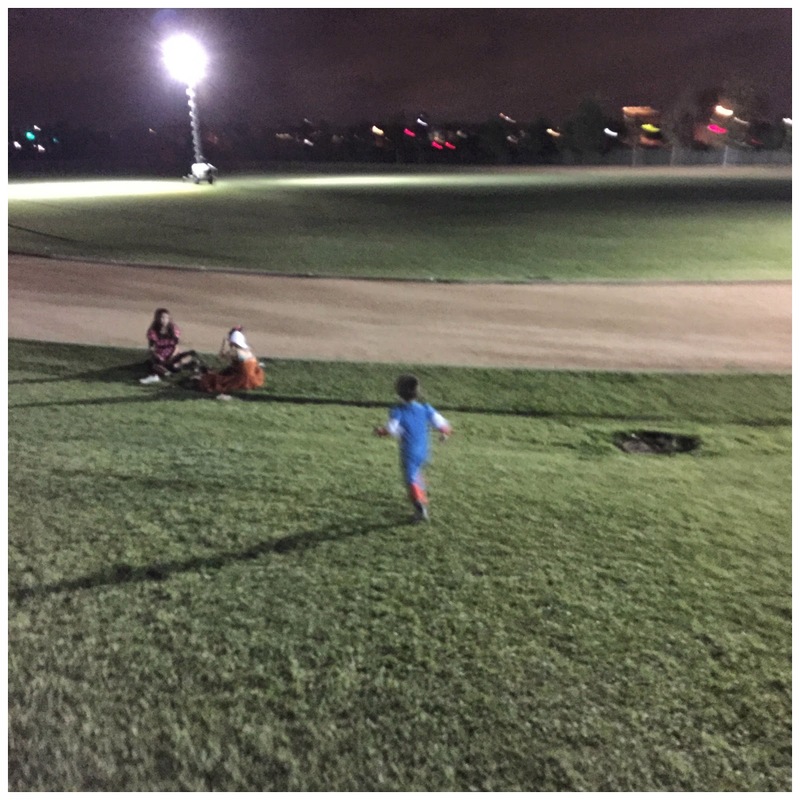 After a while, Mason was finally in a better mood, but just wanted to run up and down the grassy hill that they had. This lasted a good 15 minutes (how was he not tired???) and then it started raining so we decided to head home.... but not before we had one last failed attempt at a family selfie. Overall, the night and days leading up to Halloween definitely didn't go as planned, but hey, that's ok.
We got to spend the holiday as a family and we had fun and that's all that matters. 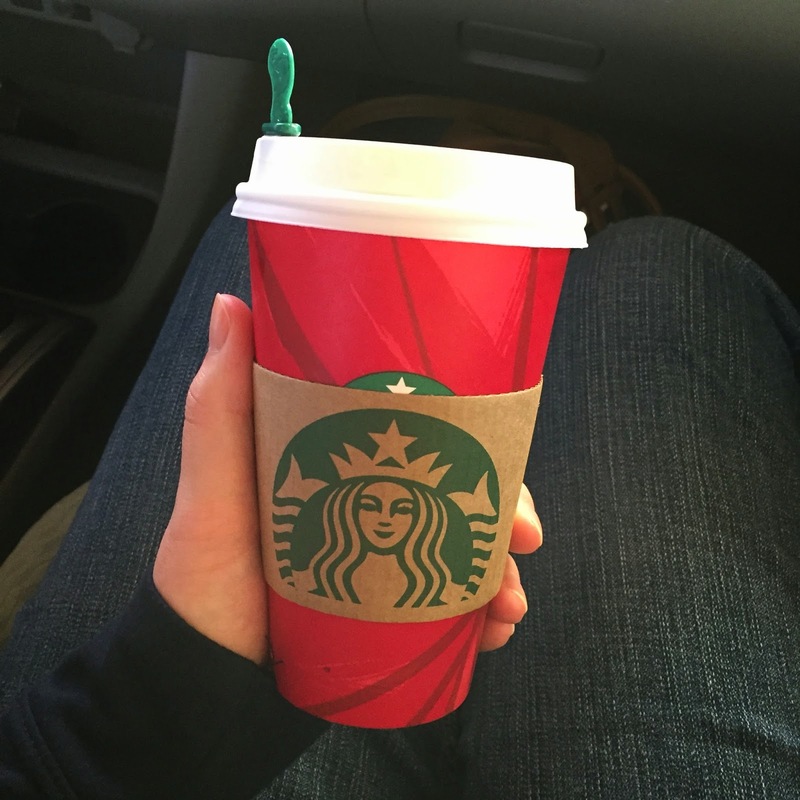 RED CUPS ARE BACK AT STARBUCKS!!!! And that means that Thanksgiving and Christmas are right around the corner! Eeeekkk! what a bummer about being sick! No fun at all! Toddlers and change - bummer he freaked when u guys came to the party but so typical of this age. Callie loves to cry when we leave her with nana but tells us to go away when we get home! 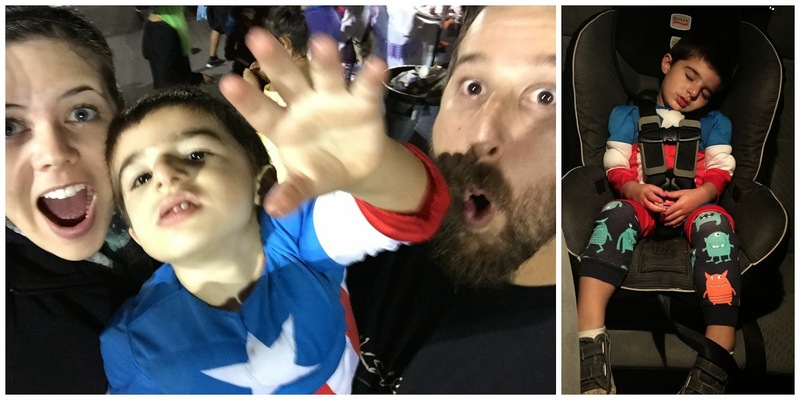 Looks like you Guys had a really fun Halloween!! Sorry that you guys were sick- we had a cold going around here too. No fun. I love his costumes, even though he was upset at his party. The main thing is that you got it spend time together as a family like you said. SO excited that Christmas is just around the corner! Your Halloween was our trip to the pumpkin patch. Wasn't our finest hour but we made it through! 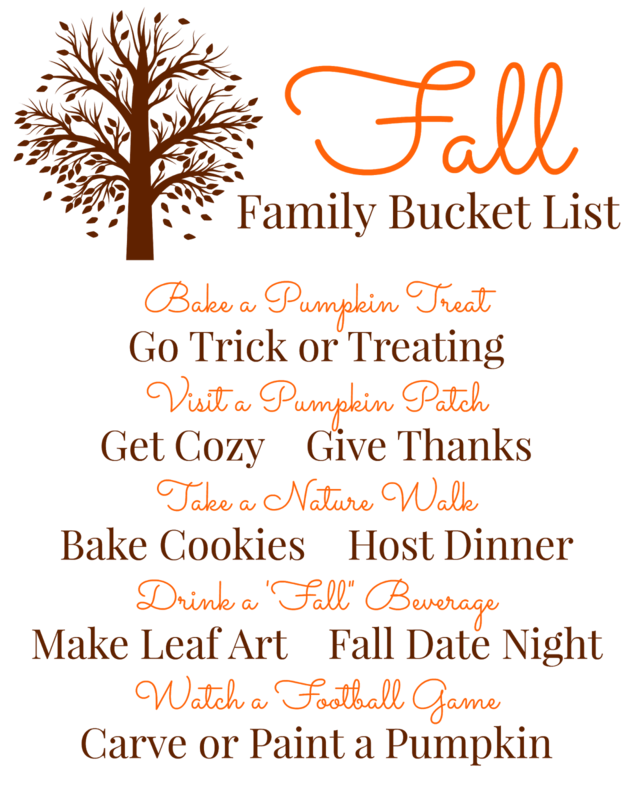 You had so many Halloween events and activities! Though they didn't pan out exactly like you may have pictured it looks like you made the very best out of every moment! Oh I'm sorry halloween didn't go as planned! Mason looked cute regardless! Seems likes a lot of people got colds over Halloween. No fun! I bought Myles a Spider man that he said he wanted for weeks and then he didn't want to wear it. So I had to return that one and try for something else. Good thing that they have onesies ones because I doubt he would have worn anything else. Looks like the trunk or treat was a blast though! haha I love this...all of the attempts and fails you mention are so typical, right? 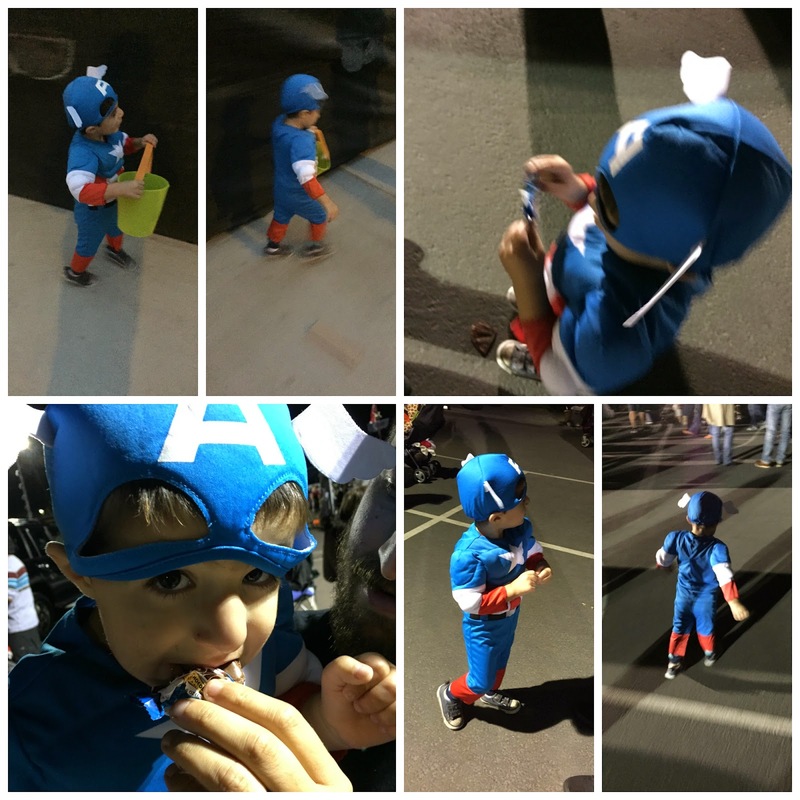 But it looks to me that you had a great Halloween and your batboy and Capt America was pretty damn cute, too! Oh no! I am sorry you were all sick on Halloween! Boo! Aww…our Mason used to do that too. When he was in the younger classes (1s, 2s, and 3s). We’d come up for the party and that boy was ready to book it. Suddenly whatever was going on at school was of no interest to him and the only thing on his agenda was going home! You managed to get cute pictures, though!! And he made a very cute batman and Captain America. Around here Trunk or Treats are the way to go! We live in such a rural area that trick or treating in neighborhoods is really hit or miss…or mostly miss! Amen to the Red cups!!!!!!!!!!!! PS - I'm with Courtney....what was in your red cup?